Version 1 EIG1 Occuring in the12019001-14105500 range. The earliest reported 845 is s/n 12019770, a hunting case movement, which comes from a run of Appleton Tracy & Co. movements. 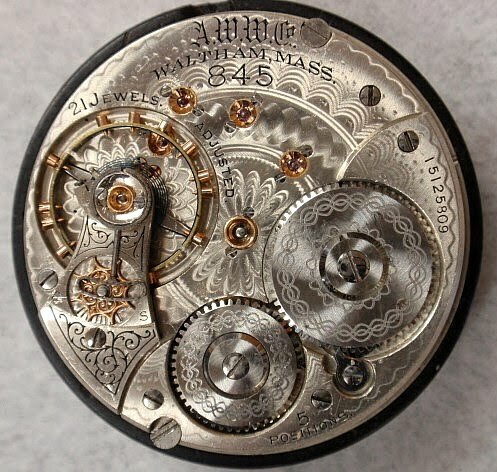 It is believed that no 845s were made in SNP1 or SNP2 movements. The movement to the right is s/n 12028595 which is from a run of Crescent Streets. The Crescent Street grade and the 845 grade are very similar, even to the point that they both use the same damescening patterns on the winding wheels. 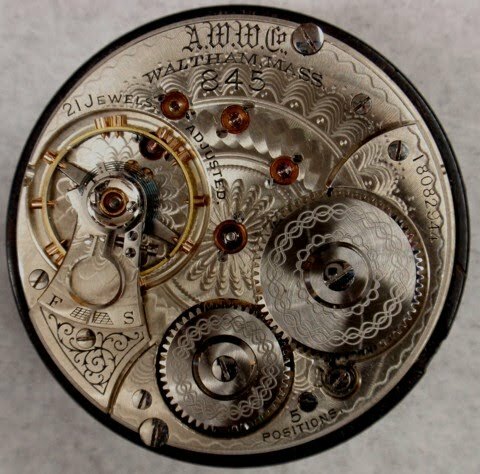 A Version 1, EIG1 movement is distinguished by the balance jewel screws being oriented in the right to left direction and at this point Waltham is using the Patented Stud, and the serial number is in Position 3, on the barrel bridge. It is anyone's guess how many very early 845s were made as they are found randomly in ATC and Cres. St. runs up to 12577501-600, which is the first run of 845s listed in the Gray Book. The next run, 12577601-12578000 is listed as a run of 17-21 Jewel Appleton Tracy & Co. movements with some 845s being reported. The next run with 845s is 12652001-12652200 which the Gray Book lists as a run of 845s. From this point on, with one exception, 845 runs are listed as such. The exception is 16079701-16081000, which is listed as a split run of Crescent Sts. and 845s. The table below shows the 845s reported up to 12652001. Version 2 of the 845 grade, EIG2, is determined by the change in position of the Case Screws. The case screws were originally positioned with one between the winding wheels (BET) and the other directly opposite it. Waltham moves the screws by shifting the one on the barrel bridge left, to the edge (EDGE) of the bridge. The opposite screw is moved a like distance to the right. Within the range of the Version 2 845, Waltham made a run of 845s that has a feature of a Version 4 movement and one from a Version 5 movement. These movements were made with the 08 Regulator which does not start appearing regularly on 845s until 16111201 and the "Groove" which does not appear regularly until the 17 millions. Suggestions are welcomed as to how to name this group. These movements carry the "5 Position" marking which is appropriate for this serial number range. At 14173201 Waltham begins marking 845s "5 Positions" with regularity. It is believed that this variation falls all within a single run. It is the first run to use the recoiling click and it is believed that these movements are the only 845s with the recoiling click and the Star regulator. The next run of open face 845s, 16111201-16112000 marks the point at which Waltham begins using the 08 or Ohlsen patented regulator consistently on 845s. 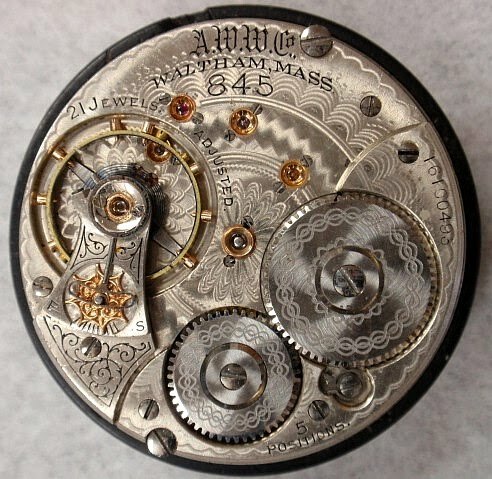 The last version is marked by the addition of a groove on the outside edge of the movement near the balance wheel.